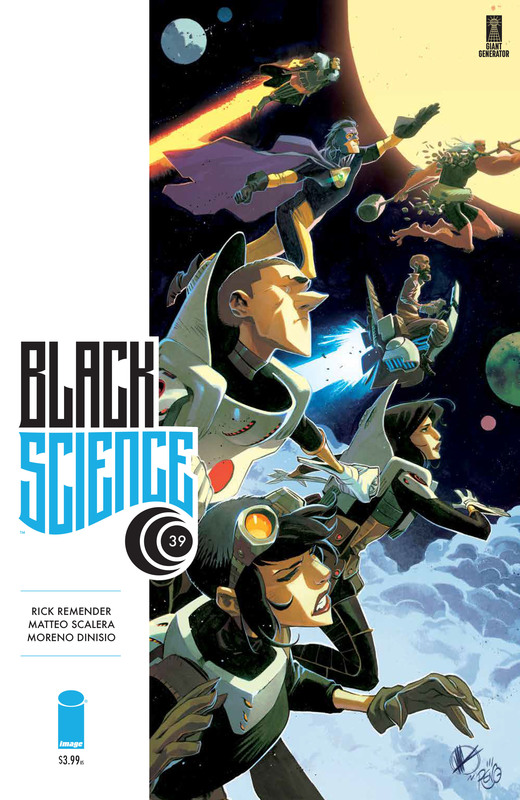 Black Science #39 Review – AiPT! Black Mirror #39 incentivizes readers to catch up on one of Remender’s best works to date. Years of twisted science-fiction, histrionics, and reality hopping madness has led to an epic family reunion unlike any other in the pages of Black Science #39. The crux of Black Science lies in the combination of scientific/philosophical theories shared with set-piece moments and relevant themes. Despite the heady subject matter, the heart of the story is family, namely the McKay family. Writer Rick Remender pulls the family together to heal old wounds and set the stage for a climactic race to the finish line. Part one of the “NO AUTHORITY BUT YOURSELF” story arc (the last in the series) takes a step back from a maelstrom of action, allowing both the readers and characters to come together for a final reunification before the inevitable blitzkrieg of chaos on the horizon. Throughout 39 issues, the McKays have been torn apart, physically and emotionally, from within and without. No one can cause hurt like the ones you love, but the scars have begun to heal. “Nuclear family” doesn’t begin to describe what this new version of the McKays has become, but it’s evident throughout the issue that time and experience has changed everyone. Some new inclusions to this motley crew have only added to the dynamic. There’s Krolar, the gigantic anthropomorphic monkey from a distant reality that has become an adopted son of the McKays. Ward, a security officer on the pillar project, has settled into his role as a lifelong family friend. Shawn, former junior scientist and pseudo ward to Nate is the “fun uncle” we all know and love. But more important than the new roles they’ve taken on, the personality growth among the core group takes center stage in Black Science #39. When the series began, Grant and his wife Sara were on the brink of ending their marriage. Grant was distant as a father and even worse as a husband. Pia was a typical angsty teenager; Nate, a rambunctious boy without a responsibility in the world. Much has changed. Pia now retains the wealth of scientific knowledge that Grant once took for granted. She was a queen, a fiancé, but more importantly a savior to an entire world — her growth to a woman and leader shows. Nate was a young boy with little guidance. He is now a hero, more accurately a superhero serving as the moral compass of the ragtag ensemble. Sara identified solely as a homemaker, having given up her dreams to raise a family. Today, she stands side by with the rest of the dimensionauts, having ventured into the depths of realities as much as any of them. Finally, there is Grant. His good intentions have consistently led to death and destruction. Despite setbacks at every turn, he remains vigilant, hopeful, and unwavering. His marriage is on the mend, so much so that he asked Sara to marry him. The repercussions of his actions remain. Doxta, the near omnipotent witch from an analog world threatens to finish off what little remains of existence; is Grant to blame? Therein lies the conflict in an issue with less obvious antagonists: Morality and determination. Kadir has been a thorn at Grant’s side from the start but managed to save one plane of reality, his own. Grant’s first reaction is to kill Kadir for murdering his brother, but the cooler head prevails. Grant banishes Kadir to the wasteland of the world outside of the tower, a death sentence in itself. The choice doesn’t sit well with Nate, whose moral fiber conflicts with Grant. Then there is the existential question of whether any of them are real. Grant and Sara discovered that all realities that rippled from the onion are akin to VR simulations lived out by being of immense power as something of a distraction from the mundane. Does that revelation make their lives any less meaningful? The question looms over the crew but doesn’t deter them from their goals. Rick Remender uses Black Science to present some rich philosophical queries that have been wrestled with for centuries, particularly the notion that life is an illusion. However, rather than beat readers over the head, he uses such a timeless hypothesis to tell a grounded story steeped in morality, humanity, and the love of a family. With the majority of Black Science‘s story in the rearview mirror, Black Science sets the stage for the climactic finish that waits down a winding road. If nothing else, Issue 39 should incentivize readers to catch up on one of Remender’s best works to date.